For two days I've been living with the charming setting and cast of characters in Joy Ross Davis' debut novel, Countenance. 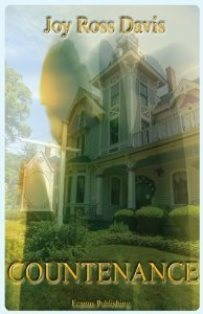 Although the Playhouse Inn exists only in the pages of this well-written novel, the author's lyrical style and storytelling ability had me roaming through the rooms (like an invisible guest) in this beautiful old bed and breakfast located in the hills of Tennessee. From the beginning, I fell in love with Aunt Sylvie, an adored cookbook author and the proprietor of this one-hundred-year-old home. We all need an Aunt Sylvie doting over us and whipping up her magic in the kitchen of an ancient inn where angels and ghosts live in harmony with the human inhabitants and guests. That is until a troublemaker named Max shows up, but I'll say no more about this rascal as you will want to read this novel for yourself. Readers will step into Nealey's shoes as she returns to the Playhouse Inn, hoping to recover—in both body and spirit— from a horrific event that claimed the lives of her husband, two young children, and sister. Readers will be charmed and delighted by brothers Worthy and Noble as they go about doing what they do best. Who can forget the lovely Anna, her two beautiful girls, Mae and Maggie, and their protective and constant companion, Lulu. And then there's Benton, the ruggedly handsome and muscular custodian of the place. Aw, Benton...how you do restore my faith. Kathleen M. Rodgers is the author of the Amazon.com bestselling novel The Final Salute. This review was originally submitted to Amazon and Goodreads.